Speedway (MA). He has shown to be capable of winning from the tail on countless nights this season, but last Saturday was not one of them. On lap 12, Alexander received front end damage after contact within a pack of cars and came to a stop at the top of turn three. Alexander went to the pits for repairs and lost 15 laps in the process. With Alexander out of the picture (as strong as he has been this season, making up 15 laps is pretty impossible, Raymond stayed out front. Daniels was now the man in second with Gary Casella and Jack Bateman behind him. Sunday’s Bond Auto Labor Day Classic at Thunder Road Speedbowl has always been a big event. This season though, it’s even bigger thanks to the fact that it kicks off a $10,000-to-win ACTion Super Series mini schedule at races. The ACTion Super Series, which celebrates the 20th anniversary of ACT, also includes the Late Model Nationals at Lee USA Speedway on September 25th and October 2nd’s New England Dodge Dealers Milk Bowl at Thunder Road. "Hopefully it will happen at the time we need it. It's a good incentive for people." Ironically, Scott who's also a three-time title holder at Thunder Road, won one of his championships at the track without benefit of a feature win. While some drivers will be looking for their first ACT win of the season, others will be looking for their first Tour win period. "It would be pretty special to get our first win (in the Super Series), we work hard," said top rookie driver Scott Payea of Milton, VT. Payea though, also looked at his situation as realistically as possible. "We're still a rookie team, so if we can just keep running up front and having strong finishes, that's just like winning for us," he explained. Discount advance sale tickets are now available for the Bond Auto Labor Day Classic 200 through the ACT office (802-244-6963), at the remaining Thunder Road weekly events and at all 32 Bond Auto locations in VT and NH. Speed51.com will have full coverage of the Bond Labor Day Classic, so stay tuned. 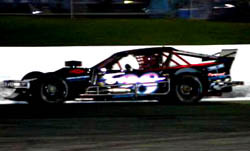 For only the fourth time in 2005, a True Value Modified Racing Series event took place and Kirk Alexander did not win. 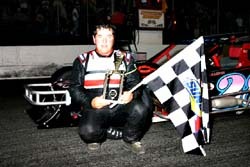 Dwight Jarvis was the man celebrating at the end of the evening last Saturday night at Monadnock Speedway (NH). It was his first victory of 2005. And if the race purse and point fund wasn’t enough, there is now an added bonus for any driver who has not won yet at Thunder Road or on the ACT Tour in 2005. ACT has posted a $1,000 "New Champion" bonus for all three of the events. The award will go to any Late Model driver who picks up his or her first win of the season, Tour or weekly, in one of the three events. "Seeing as how we haven't won one yet, I think I like that pretty well," joked former ACT series champion Phil Scott of Montpelier, VT. about the New Champion bonus. Roger Raymond started on the pole for the race and showed that Dave Dion isn’t the only ageless wonder who drivers an orange Ford in New England racing. Raymond immediately jumped to an early lead over Jimmy Dolan. Dachenhausen spun out of contention around the one-third mark while the #28 of Jarvis headed towards the front. Jarvis took over the runner-up spot from Daniels and started gunning for Raymond. Jarvis made his move on lap fifty-one going to the outside of Raymond. These two veteran drivers battled side by side for six laps until lap fifty-seven when Jarvis took over the lead. Raymond continued to have his hands full as Daniels worked him for the second spot. Daniels over came Raymond to take the position and Raymond began to slip back in the pack with what appeared to be an ill handling car. Things got worse for Raymond on lap 75, when he spun himself out of contention. Casella got into second place with a handful of laps to go, but could not get by Jarvis despite several attempts. He settled for second followed by Daniels, Dale Evonsion and Kirby Monteith. Alexander and Daniels are now tied for the TVMRS point lead with Jarvis only 30 markers back. The teams of TVMRS have their work cut out for them this weekend. They will run 100 laps on Saturday night at White Mountain Motorsports Park (NH) before loading up to share the stage with the IBG-PASS Pro Stocks on Saturday at Canaan Fair Speedway (NH). The NASCAR Whelen Modified Tour expects a very robust field of cars when they team up with the NACSAR Whelen Southern Modified Tour for this weekend’s Whelen Made in America 300 at Martinsville Speedway (VA). The event will feature a 50-lap no qualifies race on Saturday evening before the big show. With many events on the schedule that send cars home after qualifying, this might not be a bad idea for other Tour shows according to one of the Tour’s top drivers.